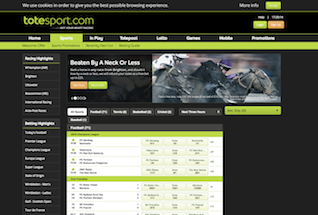 Totesport Review, All our partner sites are independently reviewed by our team of industry experts. We examine 10 different criteria and award a score out of 10 for each, adding up to a final mark out of 100. You can read a full description of our review process here. Totesport received a score of 92/100. Tote is a brand synonymous with horseracing in the UK. It has its origins as the Racehorse Betting Control Board, a corporation set up by Winston Churchill in 1928 as a safe alternative to illegal bookmakers who plied their trade at racecourses across the country. It was required to put some revenues back into the sport. The word Tote comes from the name Horseracing Totaliser Board, the new title given to the Betting Control Board in 1961. In more recent times the Tote was bought by Betfred in 2011 for £265 million. The brand Tote, because of its long association with the government and its unique position amongst bookmakers in the offline world, is one associated with trust and fairness. Their website is clean and clinical and whilst horseracing is the most prominent market, it also offers the wide range of bets you would expect from one of the best UK sportsbook online. ToteSport is licensed by the UK Gambling Commission and the Gibraltar Gambling Commissioner, allowing them to take bets from UK customers and advertise in the UK. You can join ToteSport now and take up their £25 Totesport Free Bet offer – a risk free first bet. 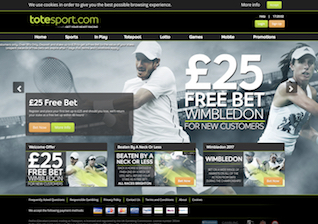 Or, read on for our full review of the Totesport service, including mobile, desktop site, tote betting, accumulator odds and their additional products, including Casino and Games. The ToteSport sign up offer is a risk free £25 bet on any sports market you choose, and at any odds. Should your first bet at Totesport lose, you will be entitled to a free £25 bet. Your free £25 bet will be credited with 48 hours of your first bet being settled, and you have 7 days to use it. The range of markets available to punters at Totesport is good, though perhaps not as wide as that offered by some of the top tier sportsbooks operating in the UK. Here the main sports are of course represented in horse racing, football, rugby, cricket, as well as darts, cycling, Aussie rules, American Football and Hurling. For those who like an alternative bet, there is also the opportunity to bet on politics – the next German Chancellor for example – TV shows – who will win Big Brother - and the name of William and Kate’s 3rd child. For fans of Live In-Play betting, there is a whole area dedicated to these markets, available from a link at the top of the screen. At time of writing there are over 70 football games in action, and options to bet on tennis, baseball and cricket too. There are live scores and some commentary to help In-Play betters, but no live video streaming. Beaten By a Neck of Less: If you bet on a horse at a chosen meeting where the promotion is running, you will get your money back in a free bet, up to £25, if your horse loses by a neck of less. Best Price Guaranteed: Such a good promotion, all UK sportsbook must be running it by now! Place a bet on any UK or Irish race, and if the starting price of your horse is better that the one you placed your bet at, you get the more favourable odds. Also applies to Totesport Greyhound racing. Double Delight and Hat-trick Heaven: Just to prove its not only about the racing, Tote offer double or triple your odds if your player scores the first try and goes on to score a second of third during the match. The Totesport desktop site is beautifully simple and slick. The brand lends itself to a clean design, with less loud advertising about free bets and bonuses than many of the big sportsbooks in the UK. So, you should find it very easy to find your way around and reach the important touchpoints of registration, account, customer services, and of course, betslips! You can bet two ways on your mobile with Totesport. The first is by text – just send your bet to the number 60021 to place it. The second way is by the Totesport app which is available to download on Android and iPhone. The app allows you to do pretty much everything you can do via the website, and also has a quick bet service that allows you to place single bets simply and easily. You can access latest scores for in-play bets, but there is no live streaming. At time of writing, Totesport Casino was not available. However, a casino-lite is open to players, called Totesport Games, and there is the promise that the casino will soon be live. The games section features a selection of slot titles, and casino games from one of the world’s best known and most popular video slots providers, IGT. Recent releases like Ghostbusters Triple Slime and Get Clucky sit alongside classics like Siberian Storm, Cleopatra Plus and Wolf Run. We recommend these games and a visit to the casino when it opens at Totesport. There is a wide range of payment options available to customers at Totesport. You can choose to deposit and withdraw using credit and debit cards, or via eWallets like Neteller, Paypal and Paysafecard. Withdrawals take up to 48 hours to process, and another 48 hours to go through on eWallets, and up to 5 days on credit and debit cards. The Totesport support team is available 24/7 via Live Chat, and can also be reached by phone on 0800 028 6468, or on email at customercare@totesport.com. Totesport is licensed from Gibraltar and the UK. To continue to receive this licensing, Totesport adheres to strict regulations on security and fariness with regards to financial transactions and all bets place on their sites.